Logisys proudly presents the first one of the kind in the world - the longest cold cathode super deluxe combo kit for the PC application. This kit includes one appr. 15" long super bright cold cathode tube, one innovative clear two-output inverter integrated with sound activated module and blue LED light and one PCI On/Off/Sound switch and sensitivity adjustable knob. This is ultimate PC lighting solution for PC modding! You need to try it to appreciate the beauty of the bright lighting and other convenient features! * Input Voltage: DC 12 Volt. * Input Connector: Molex 4pin connector with pass-through. * Output Connector: 2 Output socket for dual 15" cold cathode lights. * Inverter: Sound control activation, sensitivity adjustable, with on/off switch to override sound control feature. 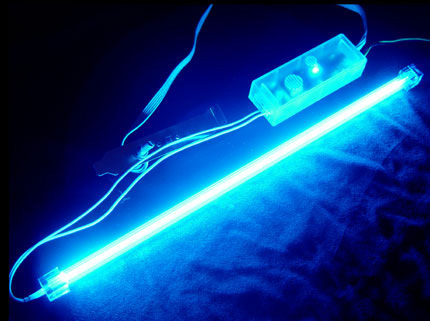 * Cold Cathode light: Appr. 15" (14.3" long in acrylic tube) length with diameter 5/8".